A 9:30 AM, Wednesday, December 12 hearing has been set in Second Judicial (Bienville, Claiborne, Jackson parishes) District Court in Jonesboro, on a motion for contempt and sanctions against Town of Jonesboro mayor Leslie Thompson and Alderman-at-Large LaStevic Cottonham. The motion was filed late last week by Louisiana’s Attorney General (AG), who is the plaintiff in the case State of Louisiana v Jonesboro. In that action, the district court ruled last July that a Fiscal Administrator should be appointed to oversee the town’s finances. See here the motion for contempt and for sanctions. Along with the motion was filed a 22 page exhibit that consists of several reports generated by Fiscal Administrator William Ryder during the approximately two months he was on the job. Despite still having no audit, and no court-appointed administrator to oversee the Town of Jonesboro’s financial affairs, the town is eligible for state and federal grants, according to the list of “non-compliant” governmental entities maintained by the Louisiana Legislative Auditor (LLA). The town has been on and off the list several times over the past few years, and was most recently non-compliant from January to late July of this year. The town was taken off the list within days of the appointment of Bill Ryder as Fiscal Administrator. However, when Ryder resigned, the town was to be put back on the list, according to several public officials who have knowledge of how the system works. The LLA’s own list, though, says the town is in compliance with the state’s audit law. A. 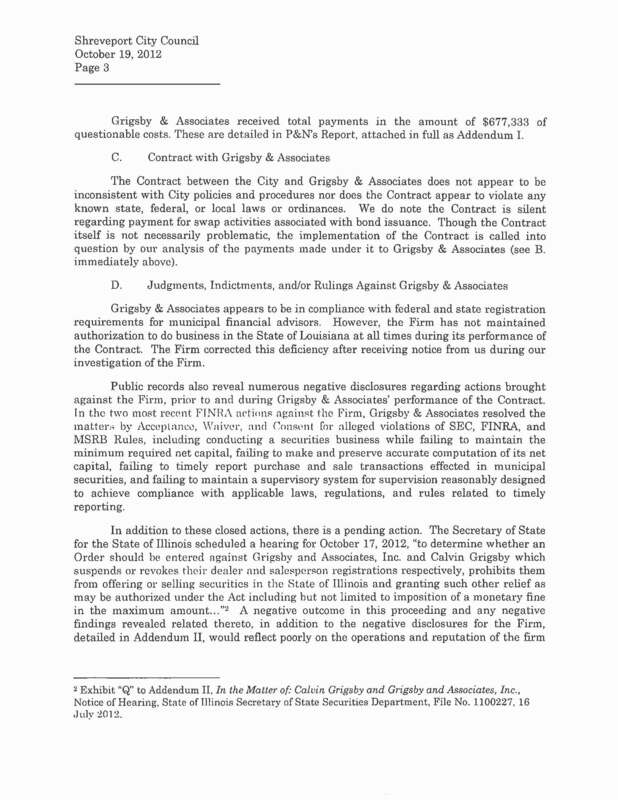 Notwithstanding any contrary provision of law, no funds appropriated in the general appropriations act, the capital outlay act, or other appropriation act, shall be released or provided to any recipient of an appropriation if, when, and for as long as, the recipient fails or refuses to comply with the provisions of R.S. 24:513. What this means is that money appropriated from the Louisiana Legislature in House Bill 1 (HB1 – General Appropriations) or House Bill 2 (HB2 – Capital Outlay) shall not be released to the recipient if they are not in compliance with the provisions of LA RS 24:513. (a) The local auditee has failed after thirty days written notice from the legislative auditor to comply with the provisions of this Section relating to timely audits. (c) The local auditee exhibits a record of egregious control deficiencies and failures to comply with laws and regulations. (d) The legislative auditor has received complaints of illegal or irregular acts with respect to the local auditee. K. Whoever violates the provisions of this Section shall be fined not more than one thousand dollars and shall be deemed guilty of malfeasance and gross misconduct in office, and shall be subject to removal. 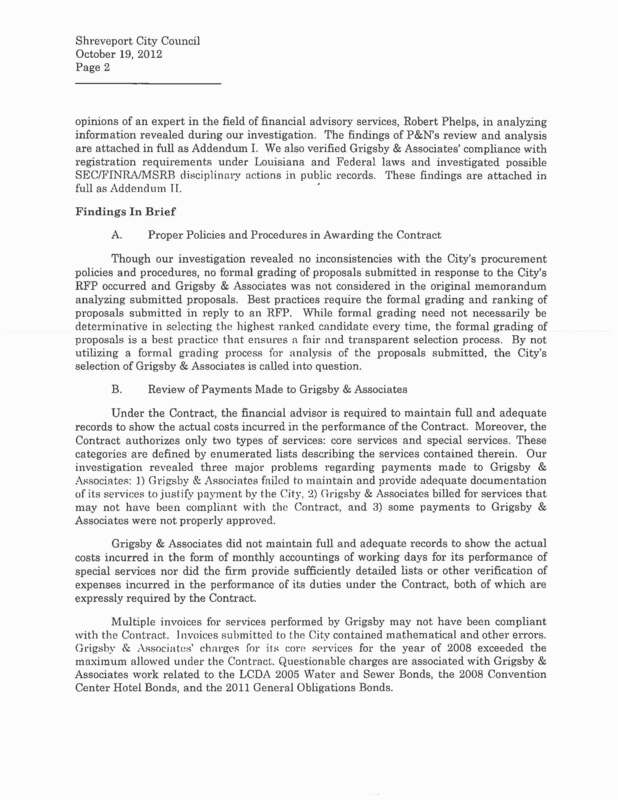 Shreveport’s contract with financial adviser Grigsby and Associates may not have been in the city’s best interest, according to dialogue Monday between Councilman Joe Shyne and Chief Administrative Officer Dale Sibley. The discussion occurred during a City Council committee meeting regarding the release of a council-requested external investigation into a San Francisco-based firm that shows possible overpayments of nearly $700,000. 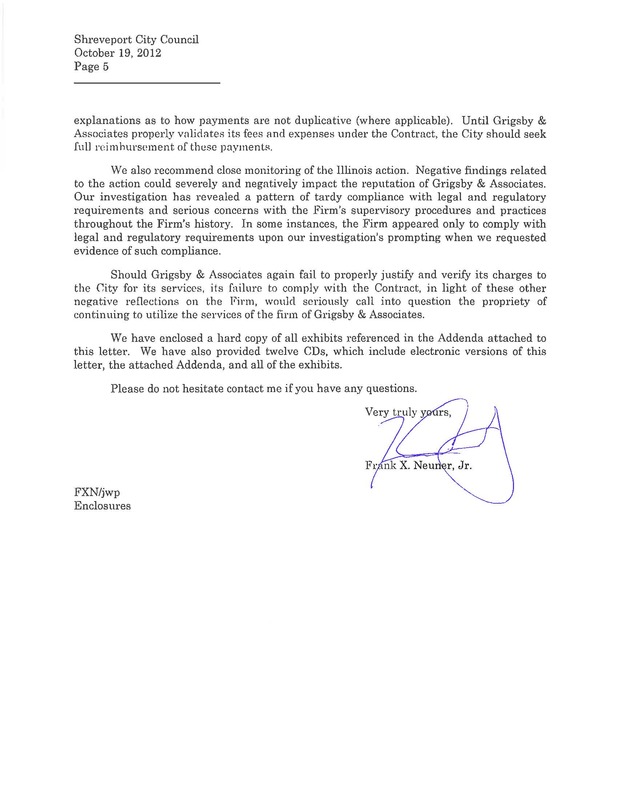 In an email he sent to reporters Monday, Grigsby says work performed is accounted for and his firm would like to meet with Frank Neuner Jr., the Lafayette-based attorney whose firm conducted the investigation, to counter what Grigsby alleges are false statements. 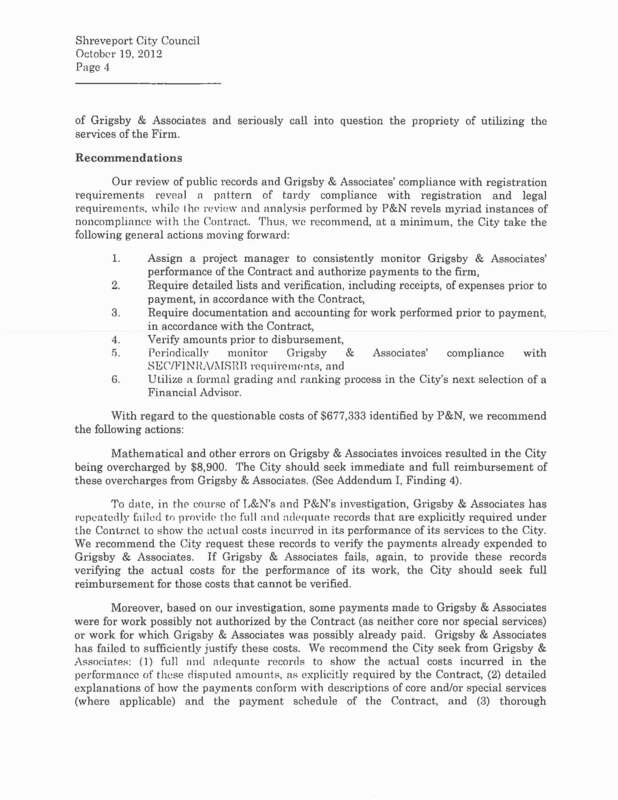 Grigsby has received no payments from the city since results of the internal audit were released late last year. The council plans to invite Neuner to fully explain his findings in person or via teleconference Nov. 13. Reconciling the external audit’s findings will require a cooperative effort by the City Council and city administration, Sibley said. “From our point of view, just like the internal audit, we take it, we start working on it. A group calling itself the “Citizen’s Alliance of Jonesboro” is threatening a federal lawsuit against as yet unnamed defendants that will allege disenfranchisement of voting rights, it was revealed at a Noon press conference today at the W. Richard Zuber City Hall in Jonesboro. Attorney for the group, Monroe’s Carol Powell-Lexing, told Lincoln Parish News Online (LPNO) that a timetable for the action had not been finalized, nor what entity or persons might be named as defendants. Local National Association for Advancement of Colored People (NAACP) representative Wendy Callahan said they would seek assistance from the U. S. Department of Justice (DOJ). The lawsuit, it was said, will claim that recent actions by the state to install a fiscal administrator to oversee the town’s finances represent a usurpation of the duly elected mayor’s authority, and thereby represents a dilution of voter’s rights. There was a bit of disagreement among some of the speakers, however. Janice and Herbert Simmons said that the town could ill afford to spend monies for a fiscal overseer, using terms like “broke” and “bankrupt” to describe the town’s money woes. For his part, controversial mayor Leslie Thomson and his administrative assistant Rev. David Dill said the town was not in a financial bind. As the town’s books have not been audited since mid-2007, it is unclear who is more accurate. Herbert Simmons went on to say that in his opinion, all the controversy since Thompson took office in January, 2007 was a “political lynching,” and was designed to get Thompson out of office. Then, as has been his custom at city council meetings, he proceeded to wonder why can’t the town come together and progress toward the future. A motion alleging contempt of court by the Town of Jonesboro’s controversial mayor Leslie Thompson and Alderman-at-Large LaStevic Cottonham has been filed in Second Judicial (Bienville, Claiborne, Jackson parishes) District Court in Jackson Parish. The motion was filed late last Friday by the Louisiana Attorney General (AG), the plaintiff in Louisiana v Jonesboro. In addition to the contempt allegations, it asks for sanctions against the two. Failure to timely deposit receivables. Most of the motion is made up of a report by the town’s former Fiscal Administrator Bill Ryder, who served from late July to mid-October. A hearing on the motion is expected soon. 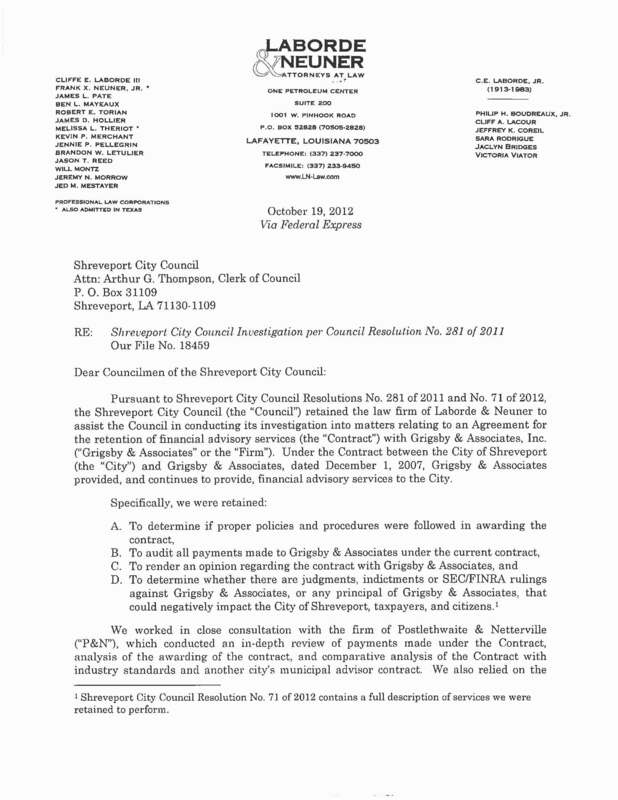 Sources have told Lincoln Parish News Online (LPNO) that the Louisiana Attorney General (AG) late Friday afternoon filed a new motion in the case of Louisiana v Jonesboro, the civil case that resulted in the appointment of a Fiscal Administrator to oversee the Town of Jonesboro’s disorganized fiscal affairs. The town’s books have not been successfully audited since the fiscal year 7/1/06 – 6/30/07. Controversial mayor Leslie Thompson took office in January, 2007. Two weeks ago, Fiscal Administrator Bill Ryder resigned because of what has been described as “non-cooperation” from the mayor. You are currently browsing the Lincoln Parish News Online blog archives for October, 2012.